What's Better: Group Running or Running Solo? 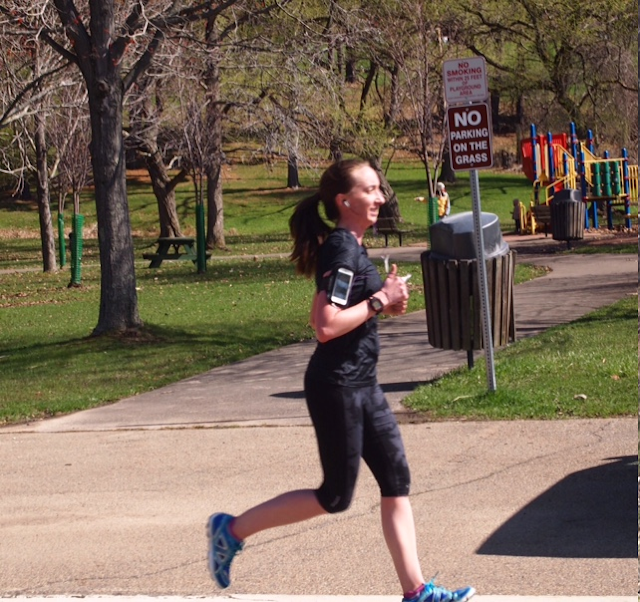 Gretch Runs: What's Better: Group Running or Running Solo? What's Better: Group Running or Running Solo? Hi everyone! Today I'll be joining in the Tuesdays on the Run linkup. The topic for today is about group running vs. solo running. I have a lot of experience with both, so I thought it would be fun to talk about the pros and cons of each! Meeting new people. You already have something in common if you're all running, and it can be an easy way to make new friends. Some of our local groups hold social events after the run, so you don't have to worry about talking during the run. If you're new to a city, this is a great way to meet new people with similar interests! Pushing yourself. Running with others is a great way to push your pace! I never want to get separated from the group, so I always push myself a little harder and go faster than I normally would when I run with a group. This can be especially helpful when you're running tempo runs or preparing for a race. Being accountable. If I'm running by myself, there's no one I'm letting down if I skip a run. In a group setting, I'm more likely to show up (even if I don't feel like it) just because I don't like to let people down. Having someone else count on you to show up is a big motivator! This can be especially helpful in the winter when it's dark and cold out in the morning. Nothing brings together people like suffering through 10 miles when it's 10 degrees out! Finding new running routes. When I run by myself, I typically run the same 3-4 routes in my area. One of my favorite things to do is explore new areas, and when I run with a group I don't have to worry about getting lost! I've found a lot of gems in Pittsburgh thanks to running on different streets. Nothing like getting a city tour on foot! Different goals. Not everyone in the group has the same goal race or the same training plan, so it can be difficult to be on the same page. While I may want to have a speed workout on Wednesday, my running friends might have an easy 3 miler on their schedule. It can be difficult to coordinate schedules, and make it challenging to run together. Becoming too comfortable. After running so much with a group, it can be really tough to run a race solo. All of a sudden, you have to worry about your own pace, and don't have conversations to distract you during the race. Sometimes we can get a bit too comfortable with having others around, and struggle to run alone. Staying with the group. Some days I feel absolutely great, and can run 8:00 miles without breaking a sweat or breathing heavily. Other days I'm gasping for breath finishing a mile in 10:00. When you're with a group, you don't really have the opportunity to run your own pace. You might also have partners that are below your current fitness level, which could hinder progress that you could make by running alone. Alone time. Honestly, sometimes I just need a bit of "me time", and running is a great way to do that. Heading out for an hour on a trail is a great way to relax and not have to worry about a to-do list or what happened at work that day! Listening to your body. When I run alone, I'm much more focused on my own performance and body, rather than trying to keep up a conversation. I can make sure my form is good, make sure my heart rate and breathing are in the right zone, and slow down and speed up as needed. Improving mental toughness. Any runner knows that the sport is just as physical as it is mental. When I run with others, I feed off their energy and use them as a mental crutch to keep going. Running alone is a lot tougher- you have only yourself to use as motivation. There's no cheering partner beside you, or someone there to complain about the run with. Mental strength helps out in races just as much as all those miles you put in during training! Following your own schedule. If I feel like going for a run at 8:00PM, I just have to lace up my shoes and go. When I wake up early in the morning, I can just head out for a run before work. When I don't have to check with someone else's schedule, I'm more likely to go for a run spur-of-the-moment, rather than worry about coordinating with another person. Sometimes it's easier just going by yourself! Unsafe. Simply put- being out by yourself, usually listening to music, is not very safe. Running with another person or an entire group is much safer option- not only to avoid being attacked or mugged, but also in case you get hurt or have a medical issue. Every time I run, I let someone know where I'm going, how long I'm going to be gone, and take along a small hand-held mace can and my phone. Monotonous and boring. Occasionally when I'm out for a long run by myself, running the same course I always run, listening to the same music I always play, I just feel bored. I lose motivation just because the run isn't interesting! Running with others can keep our mind occupied and keep things fun. Staying in your comfort zone. I don't know about you, but my body loves to be challenged and try new things. Running the same course over and over at the same pace week after week won't really give us much improvement over time. Running with different people on new routes with a different terrain/elevation will keep our bodies challenged and make us stronger runners! Overall, I think there are definitely benefits to running with a group and running solo. For me, the best mix is to run with a group for the workouts that are mentally tough for me: long runs and hill workouts. On my own, I'm not motivated and often cut these short. I feed off the others' energy to keep me going! On the other hand, I prefer to do recovery runs and tempo runs on my own, where I can control the pace. Do you prefer solo running or going with a group? What are some hidden gems you've found while running? I think the biggest thing that kept me from group runs when I lived in DC was the schedule thing. The group I joined met every single hour of the day basically (it was a huuuuge group, so the times were staggered for everyone to get one run in SOMETIME), but I could only do mornings or nights. I am NOT a night runner - I just feel blah after 3pm haha, but to meet for the 6am run would mean getting up around 4 to commute there... thus, I stayed solo. However, the BEST part about group running, in my opinion, is finding new routes. Due to the "unsafe con" you posted above, I tended to keep to what I knew trail-wise and didn't want to venture out early in the morning in areas I didn't know. I know exactly what you mean about scheduling! It can be so tough to make it all the time. Love finding new routes! And I'm glad you're staying safe out there- good job!! Haha we're opposites! I can see the benefits of doing it that way. Whatever works for you is good! This is great! I think you really cover the pros and cons of running both solo and in a group (many that I didn't even really think about.) Lately, I've really loved running in a group because staying chatty keeps me distracted. Not sure I would do a ton of group runs if I was training for a race, but sometimes, it's fun to run 'in a group' but not actually keep the same pace as everyone. (I did a training program for the Cherry Blossom 10 Miler and we all met at the same time but did our own thing.) Just being out there and knowing that there were other people running too was comforting. Thanks Lauren! That training program sounds really cool and like something that I would like! Being accountable while still running your own pace. Best of both worlds! I agree that both are good for all these reasons. I've only done long runs with a group. I tried to do a run at my race pace once with a group & that didn't work out well because no one actually ran the pace we were supposed to! I would love to start doing speed work with others. Ohh that's never good..that's another problem that I've seen! You might be in a 10:00 pace group, but sometimes they'll go a minute faster and sometimes a minute slower. Not reliable at all! I believe most of the groups I listed above have track workouts around the city if you'd be interested in checking them out! I use the treadmill a lot with solo runs but it's also a necessity. I think I have to get my runs done later in the morning now and that means the treadmill. That's great that you're still out there getting it done! Great job Lesley! Well, yeah. I need to run alone because running is my escape from all the insanity (we have a blended family of 6 kids ages 14-1) so the last thing I want to do is hang around MORE people and make conversation. I need SILENCE. Or heavy metal music...lol. But there definitely is something to be said to running with people, especially for those long training runs. I'll run them with my friend Lora who is matched with me in speed and endurance and I notice we travel along at quite the clip without even knowing how fast we are going. Pretty sweet. I prefer to run most my runs solo or with my boyfriend. I do like participating in my run club once a week just for the extra push that comes from running with a group of people. I think you hit the nail on the head with a lot of the pro's and con's of each, and gave a fair view of each side of the coin. I think I will always be a mainly solo runner. Same here! I'm so happy that Dan started running, so I get to do some of my runs with him. For my long runs, I like to start out with him at a nice easy pace, so I'm already 1/4 or 1/3 of the way in and don't even realize it! Maybe one day I'll get him to sign up for a half with me so we can do a whole 10 miler together! I don't think I knew that you were also a PA gal. I don't mind running by myself, but I am very concerned about the safety issue. Yup I am! I'm lucky to live in a very safe area in Pittsburgh and there are always lots of others out when I'm running. Safety is SO important! Great list! I like running with my buddies because I know that they can push me and that the time will pass quickly. Running solo is great just to focus on me, and gives me the flexibility to run when I want/need to. Thanks Janelle! You're exactly right..they both have their positives and negatives. Mixing them is the best option! Haha that's another great reason to join a group..getting out! Planning one group run a week sounds like a perfect amount for me. I like them both for different reasons, so I try to mix it up. My default though is to run by myself as I can just go whenever at whatever pace for however long and not have to think about what others are doing. It's....RACE WEEK! MIMM, Playlist, and Goals!